The Ambassador of Turkmenistan and Dean of Diplomatic Corps H.E. Mr. Atadjan Movlamov acknowledged ECOSF efforts for providing the platform to the scientific community of the ECO region for sharing knowledge and development in the field of Science, Technology and Innovation (STI). He made these remarks during a meeting between him and the President ECOSF Prof. Manzoor H. Soomro on 26 October 2018 at Embassy of Turkmenistan in Islamabad. Earlier, the Ambassador warmly welcomed President ECOSF at his office. Prof. Soomro while briefing and updating the Ambassador shared the programmes and activities of the Foundation for promotion of STI in the region including the research project funding, Travel Grants for researchers and implementation of Inquiry Based Science Education (IBSE) in ECO region with the support of the Foundation’s partners La main a la pate Foundation (LAMAP) of France, ISTIC Malaysia and IAP SEP. He also briefed the Ambassador about Digital @ B&R Double Hundred Universities Cooperation Program of AETDEW & DCHUP and requested him to support in identifying two ICT universities from Turkmenistan. President ECOSF also informed the Ambassador that the Foundation has developed strong collaboration with international and regional organizations and development partners, such as UNESCO, Islamic Development Bank, International Science, Technology and Innovation Centre for South-South Cooperation under the auspices of UNESCO (ISTIC), Malaysia, La main la pate Foundation of France, China Association for Science and Technology (CAST) and its Children and Youth Science Center (CYSC), Korea Institute of Science & Technology Evaluation and Planning (KISTEP), Turkic World Educational and Scientific Cooperation Organization (TWESCO), Astana and many other organizations. During the meeting, the payment of Annual Mandatory Contribution as main agenda item came under discussion. 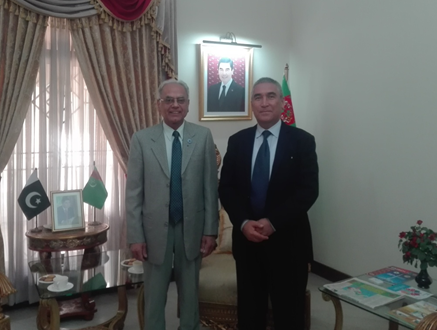 President ECOSF requested the Ambassador to support and pursue the matters pertaining to ECOSF with authorities in Turkmenistan. The Ambassador assured his support to pursue the concerned authorities in Ashgabat to resolve the matters pertaining to Annual Mandatory Contribution to ECOSF by Turkmenistan, fresh Nomination of Eminent Scientist / focal points and identifying two universities for Digital @ B&R Double Hundred Universities Cooperation Program . H.E. Mr. Atadjan Movlamov thanked the President for visiting the Embassy and updating him on recent activities of the Foundation.